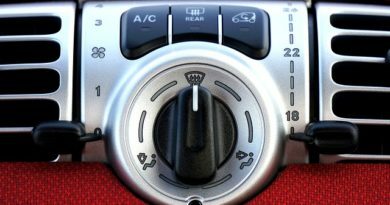 Manual Transmission (MT) or Automatic Transmission (AT), which is best? This is always being a hot topic for the debate when it comes to choosing a vehicle for different purpose, as both the transmission system have advantages over each other which give rise to many questions like why the formula cars being the best automobile uses MT? 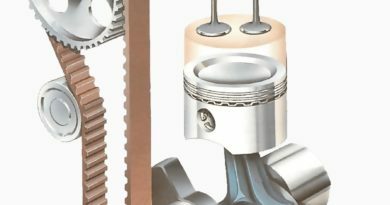 Why it is advised to use MT when there is a need of high torque and sudden shifting? Let’s discuss these points. A manual transmission is a house of various components like gears, shafts and various selecting mechanism that are arranged in special fashion to provide appropriate torque and speed ratios to compete with the challenges provided by the different road conditions, the shifting from high torque to high speed and vice-versa is performed manually by symmetrical pushing and pulling of the gear lever by the driver. 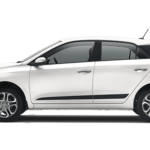 The vehicle with MT usually comes with n-speed manual with or without reverse configuration where ‘n’ denotes the number of speed ratios or shifts for example-Maruti Suzuki swift comes with 5-speed 1-reverse manual transmission. 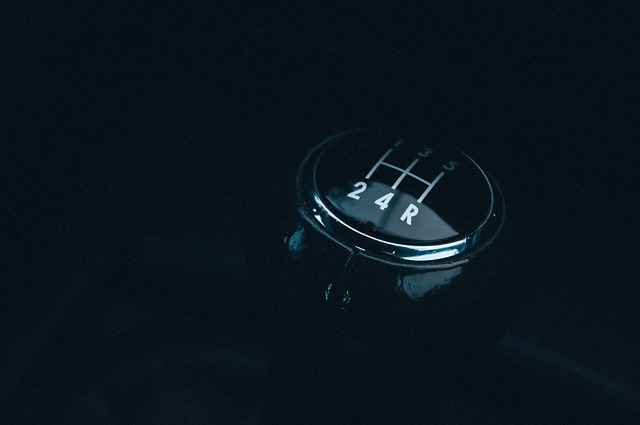 Why do We Need Manual Transmission? Manual transmission or manual gearbox is always being an important part of an automobile since the introduction of the transmission and almost covers the 50-60 % of the total vehicle that are on the road today because of its various advantages over others. When the vehicle bears uncertain load due to different load conditions like overweight and road conditions high torque is required, so to fulfill this need a manual transmission is required which provide high torque ratios. When we talk about race cars due to zigzag track sudden change of gears from high torque to high speed is continuously required so the use of manual transmission with quick response shifter is must. In heavy vehicle like truck which has to carry uncertain load to uncertain road conditions like hills, country sides etc very high torque is required which can be fulfilled with the manual transmission or gearbox. Commercial cars prefer manual transmission. (i) Main-Shaft- It is the shaft that is also called the output shaft and is placed in front of the clutch shaft and in parallel to the lay-shaft. gears, gear lever along with the meshing devices such as dog clutches and synchromesh devices are mounted over this shaft. 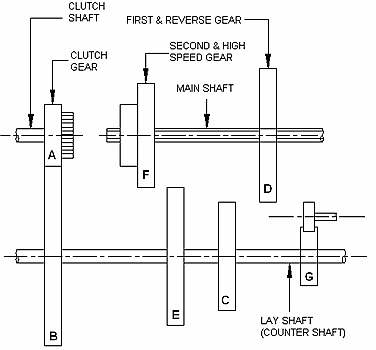 (ii) Lay-shaft or Counter Shaft- It is the shaft used as an intermediate shaft between the clutch shaft and the main shaft, it is usually mounted below and parallel to the main shaft, and act as an engine output carrier from the clutch shaft to the main shaft. 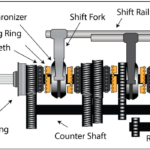 (iii) Clutch-Shaft- It is the shaft that carries the rotational output from the engine’s flywheel to the transmission with the help of clutch that engages and disengages the output from the engine. (i) Spur Gear: Used in old sliding mesh gearbox these types of gears have straight cut teethes. (ii) Helical Gear: They are the modified version of the latter as they have angular cut teethes. (iii) Bevel: They are best of all above gears having a conical cross-sectional area with angular cut teethes. (iv) Idler-gear: It is the small gear used as a reverse gear usually mounted over the lay shaft. 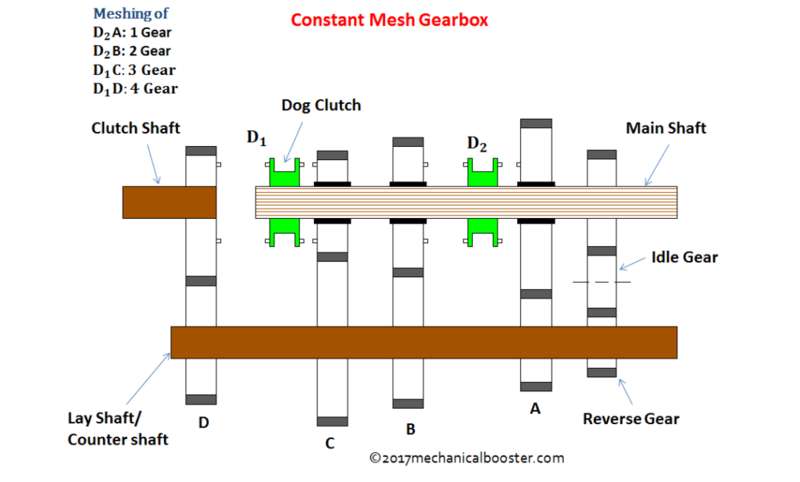 (i) Dog Clutches: They are the devices used for meshing of gears in constant mesh gearbox. (ii) Synchromesh Devices: They are the devices which are used in synchromesh gearbox for the meshing, these devices provide smooth shifting of gears. 4. Gear lever- It is the lever used by the driver to shift a gear. This is the oldest type of gear box used. 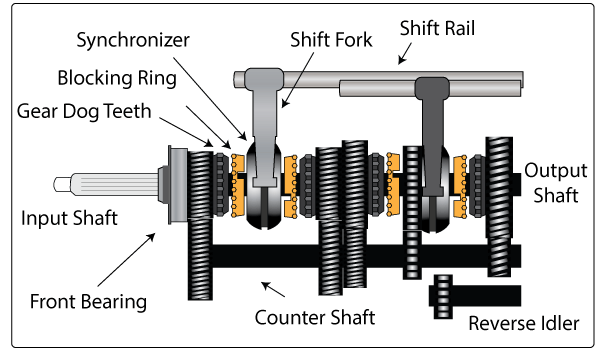 In this type of gearbox shifting occurs by the sliding of gears over the splined main-shaft in order to mesh with the appropriate gear on the lay-shaft whose one gear is in constant mesh with the clutch shaft gear in order to carry rotational motion for the conversion(high torque or high speed)as required by the drive, this gearbox requires special technique for the shifting that is usually known as double-declutching and also the meshing was so noisy and harsh ,that gives rise to the development of new gearbox system. Note-They were usually came with max of 3-speed manual shifts. 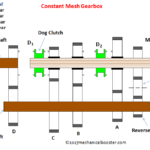 This is the modified version of the later which was introduced to over the limitations of the later, in this type all the gears on the main-shaft, lay-shaft and clutch-shaft are in constant mesh with each other and the selection of the appropriate gear is done by the special meshing devices known as dog clutches which slides over the splined main-shaft in order to select the appropriate gear as need by the drive.This system flushes away the double-de-clutching problem and made the drive less noisy as the spur gears of the sliding mesh is replaced with the helical or bevel gears ,but the shifting of gear is still not smooth and also there is a lot of wear and tear of the dog clutches due to the different rotational speed of the shafts while meshing, which leads to the high maintenance. Note – They came with 4 or 5-speed 1-reverse manual shift configuration. This is the latest type of gearbox used from decades as this system overcomes all the limitations provided by the constant mesh gearbox or sliding mesh gearbox and also improves the output capabilities of the manual transmission system, in this type the dog clutches from the constant mesh gearbox is replaced by the synchromesh devices which first bring the main-shaft and lay-shaft at same speed by the frictional contact, then meshing of the appropriate gear occurs which makes the system smooth and also decreases the maintenance of the gearbox, today this system usually comes with 5-speed 1-reverse manual transmission configuration. Note- They are coming with 5-speed 1-reverse configuration. 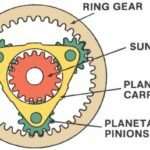 When the driver presses the clutch pedal in order to shift the gear, the disengagement of the engine flywheel and clutch shaft occurs which lets the driver to select appropriate gear according to the need of the drive. When the gear lever is pushed or pulled by the driver in order to select the particular gear, the synchromesh device which is attached to the particular link slides towards the selected constantly meshed pair of gears . At first this synchromesh device makes the frictional contact with the selected pair and the shafts in order to bring the rotating shafts at the same speed. Then the pair of gears having appropriate gear ratio is meshed with the synchromesh device in order to obtain output given by the pair of gears ,which is then transferred to the main shaft. Then this output with appropriate torque or speed is transferred to the final drive when driver releases the clutch pedal which completes the shifting of gear. When it comes to the selection of reverse gear the contact of synchromesh device is made with the idler gear which in turn reverses the rotation of the main-shaft and the drive starts moving in reverse direction. 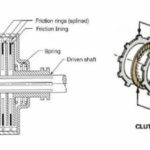 Note – As constant meshing of gears and Continuous sliding of synchronise devices is there so constant supply of lubricating oil should be there in order to avoid wear and tear of the components of the manual transmission. 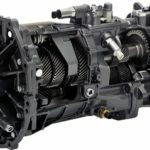 Specifically manual transmission covers 52% of the total automobile market which means more than half the vehicle on the roads are equipped with MT. All the heavy vehicles such as trucks,loaders etc.are equipped with MT. Almost all the bikes on the road are having manual gearbox with usually 4 or 5-speed shifts with no reverse. All The formula race cars uses manual transmission with quick response shifting mechanism. 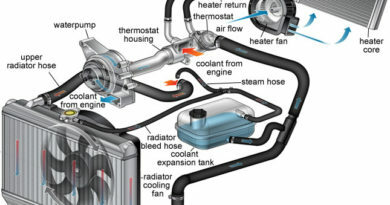 Almost all the commercial cars uses MT due to its low cost except high-end cars like audi,bmw etc.